The Cardinal’s combined score of 193.800, an improvement from Monday (193.250), placed them behind Boise State (195.300) and ahead of UC Davis (193.275) and Yale (188.900). Although eight Stanford gymnasts combined for 13 top-10 finishes in the meet, inconsistencies throughout the evening put pressure on the Cardinal. One freshman standout, Kaylee Cole, earned her first individual event victory with a meet-best 9.875 on vault. Cole competed in the all-around for the first time, placing seventh. Senior Rachel Daum impressed again in the all-around, placing second with a score of 38.975. Coming off a first-place finish on bars at the NorCal Classic, Stanford was not as consistent on the event this time around. A leadoff fall sparked a rally, with the next four gymnasts hitting strong routines. Daum and senior Nicolette McNair each put up 9.800, followed by sophomore Dare Maxwell’s 9.850 and freshman Aleeza Yu’s 9.825. In the last performance on bars, however, Cole missed her first release, and the Cardinal finished the event in third place. In its next event, Stanford fought hard on beam. Senior Danielle McNair and freshman Ashley Tai led the way with matching scores of 9.825, tied for third overall in the meet. Cole and sophomore Taryn Fitzgerald were right behind them, both posting 9.800. Beam was the Cardinal’s best event of the night and the team showed improvement from Monday, scoring almost a full point higher than in the NorCal Classic. Stanford’s start on floor was a mirror of bars. A missed first routine put pressure on the following performances, but the team recovered well, helped by freshmen Tai (9.600) and Cole (9.700). Daum delivered a clutch 9.800 to keep the team in contention as they moved into the final rotation. The Cardinal finished the meet with impressive vaulting, maintaining the impressive streak that they have had so far this season. Led by Cole’s meet-best 9.875, the Cardinal also relied on McNair (9.775) and Tai (9.750) to end the meet on a high note. With strong potential from both new freshmen and returning upperclassmen, Stanford has the ingredients of a top team. 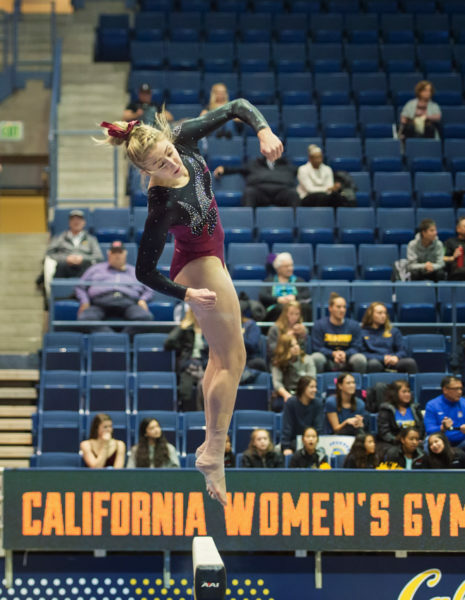 Although junior Elizabeth Price did not compete in UC Davis, she remains a top national gymnast, earning Pac-12 Specialist of the Week honors last Tuesday for her work at the NorCal Classic. The team’s major task this season will be developing consistency on all four events. If the Cardinal can putup the scores they are capable of on a regular basis, they can compete with top teams in the country. This meet at UC Davis showed that the team is getting better and continues to display resiliency in high-pressure performances. The Cardinal will have a full week of practice to polish up their routines before traveling to take on Southern Utah next Friday at 6 p.m.